For everyone’s favorite Engorge Dinos. AUTO (VC) GB3: When this Unit Retires your Rear-guards, you can pay [Counter Blast] 1. If you pay it, Call that card to (RC), during that turn, that unit and this Unit gain Powe+3000. AUTO (VC): [Choose 1 face-down “Great Emperor Dragon, Gaia Dynast” in your G Zone, flip it face-up] When this Unit is Engorged, you can pay the cost. If you pay it, choose 1 of your Rear-guards, Retire all Rear-guards in the same column as that Unit, [Counter Charge] 1. CONT (VC/RC) GB2: If this card is Engorged, this Unit gains Power+5000. Then, if this Unit is your Vanguard, it gains Critical+1. AUTO (VC): During your turn, when your G Unit [Stride]s, choose 1 of your Vanguards with the Engorge ability, during that turn it gains “AUTO (VC): [[Counter Blast] 1] When this Unit becomes Engorged, you can pay the cost. If you pay it, draw 1 card.”. 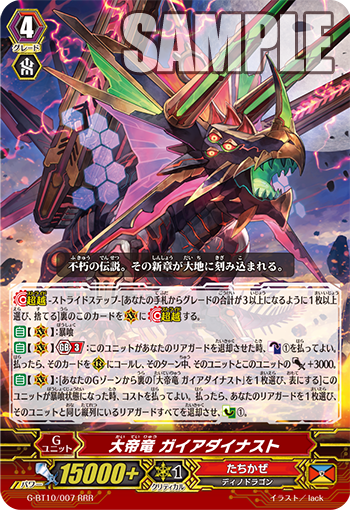 “Great Emperor Dragon, Gaia Dynast” is a G Unit with the 《Tachikaze》 clan ability, 【Engorge】, and when it becomed Engorged, you can choose 1 of your allies, and then Retire all Units in the same column as it to Counter Charge 1 card. As well, you can Retire all of your opponent’s Rear-guards as well. 【Engorge】, for the unaware, is when a Unit attacks, you can Retire 1 or more of your Rear-guards, and during tht turn, that Unit becomes Engorged. When a Unit is Engorged, it can activate various abilities, and you recieve various benefits. And if you achieve Generation Break 3 and you have “Gaia Dynast” you can Call Units Retired with 1 Counter Blast, and then the Called Unit and Dynast gain Power+3000. Its Column Retire effect allows you to recover costs without much waste, so aim to attack repeatedly. And since its Generation Break 3 isn’t restricted to once per turn, you can Call the Units you Retire for the Cost. And since Power is also gained, you can easily attack on its own. And on top of that, to further power up them is “Frenzy Emperor Dragon, Gaia Desperado”, a Grade 3 Unit with “Gaia” in its card name that can also serve as a Rear-guard. Its Stride Skill is when your Vanguard becomes Engorged, you can pay 1 Counter Blast to draw 1 card. Unlike “Emeperor Dragon, Gaia Emperor”, you can also activate its abilities if it’s a Rear-guard. And when this card becomes Engorged, if it’s a Rear-guard gains Power+5000. Meaning it can become Power 16000 in base, meaning its attack can Hit. By smartly using the 【Engorge】 ability of Tachikaze to seize victory!